I occasionally take part in cooking contests at a wonderful bookstore in my neighborhood that sells only cookbooks, Omnivore Books. When they announced their latest challenge, a pudding contest, I was eager to develop my entry. I started with prototyping the pudding base, aided by tastes and feedback from my friends and colleagues at the d.school. I received great feedback from them regarding taste and texture; the overall taste was well-received, but the texture of the banana wasn’t working. From there (and based on a recommendation from a friend), I turned to a technique that Cook’s Illustrated has developed to boost the banana flavor in banana bread: microwaving bananas and then straining them for their juice. This improved the banana flavor without the unappealing chunks in the pudding. With the pudding set, I decided to make the roasted bananas a garnish. I added a crème fraîche whipped cream to balance the sweetness of the pudding with some acid and tang. I decided at the last minute to add caramel sauce to amplify the caramel notes of the pudding. The result is a fairly complicated dessert that is well worth the effort. 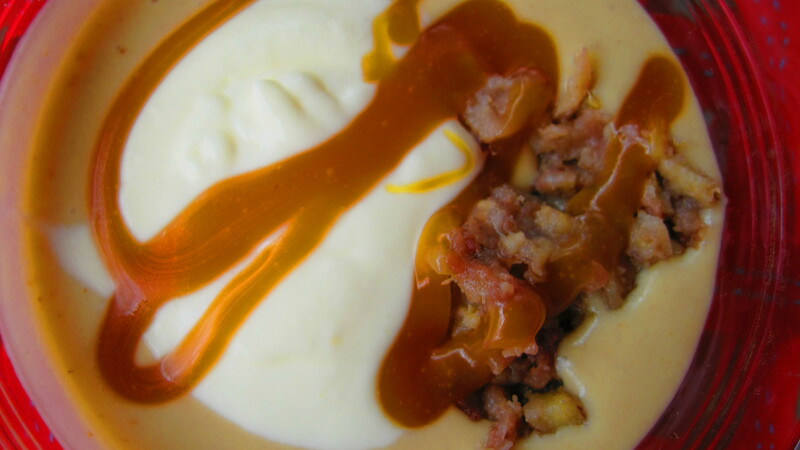 The salt, the richness of the caramel, the toasty flavor of the roasted bananas, and the tang of the crème fraîche offer a balanced, complex dessert. Measure milk and set aside. Separate egg yolks and set aside. Peel and roughly chop bananas and place in a microwave-safe bowl. Cover with plastic wrap and cut two small slits in the wrap to let hot air escape. Microwave on high for 5 minutes, or until bananas are soft and have released some liquid. Add half & half to bananas and stir to combine. Put banana mixture into a sieve and push banana mixture through sieve into a bowl. Much of the banana pulp will be left in the sieve. The liquid in the bowl should be an off white color and slightly thick. There should be about a 1/2 cup of liquid. Mix cornstarch into the banana liquid. Set aside. Whisk egg yolks with 1/2 cup milk from the 3 cups set aside. Put a medium sauce pan on medium heat. Add sugar and stir until it dissolves. Continue stirring. When sugar has melted, it will start to brown. Watch closely while stirring and remove from heat once the sugar has developed a deep caramel color. Be careful! The sugar can quickly burn at this stage. While off the heat, carefully add the remaining milk. The sugar may seize and get hard — that’s okay! Put pan back on medium heat and return the liquid to simmer. Continue stirring. The sugar will dissolve after a few minutes. Once the sugar is dissolved and the milk has a caramel color, add the banana/cornstarch mixture. Stir for 2-3 minutes. Mixture should thicken. Add 1/2-1 cup mixture from the pan to the bowl of yolks. Stir to combine. This technique helps temper the eggs to prevent them from overcooking. Add egg yolk mixture to the pan. Stir. Increase heat to medium and stir until mixture reaches the desired thickness. Remove from heat and stir in butter, vanilla and salt. Continue stirring until the butter has melted. Strain pudding through sieve into a large bowl. Immediately cover with plastic wrap so that the wrap is touching the surface of the pudding. This prevents a skim from forming. Chill at least two hours. Peel bananas. Cut into thirds and slice each chunk in half. Put in a bowl with brown sugar and bourbon. Toss to coat. Put in a small baking pan. Top with small chunks of butter. Bake 10 minutes more, or until bananas have caramelized. Remove from pan and dice. Set aside. Place whipping cream in a bowl. Whip to the desired consistency, about 4 minutes. Add crème fraîche and whip 2 minutes more to combine. Mix sugar and water in a medium sauce pan until the sugar has dissolved. Turn heat to medium-high and stir. When sugar has melted, it will start to brown. Watch closely while stirring and remove from heat once the sugar has developed a deep caramel color. Be careful! The sugar can quickly burn at this stage. While off the heat, carefully add the whipping cream. The sugar may seize and get hard — that’s okay! Put pan back on medium heat and return the liquid to simmer. Continue stirring. The sugar will dissolve after a few minutes and the sauce will thicken. Add vanilla and salt. Stir to combine. Remove from pan and let cool for at least 2 hours. Put pudding in serving bowls. Top with 1-2 teaspoons of roasted banana. Top with 1 tablespoon of crème fraîche whipped cream.